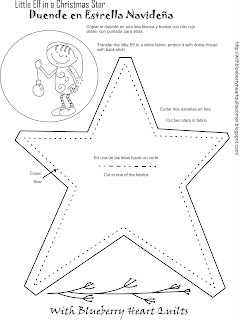 CADA SEMANA UNA ESTRELLA NAVIDEÑA... CON UN PEQUEÑO DUENDE. HOLA MIS QUERIDAS AMIGAS, QUE GUSTO TENGO YA PODERLES ENSEÑAR EL PRIMER PATRON GRATIS QUE TENGO PARA USTEDES,PARA LA NAVIDAD, UN PEQUEÑO BORDADO DE UN DUENDE DE LOS QUE HICE UNA VEZ EN UNA ILUSTRACION, Y QUE MEJOR, PODER COMPARTIR CON TODAS USTEDES, EL PASO DE MIS ILUSTRACIONES A LAS ESTRELLAS NAVIDEÑAS, YA QUE HE RECIBIDO VARIOS E-MAIL PREGUNTANDOME SI TENGO TELAS IMPRESAS CON MIS ILUSTRACIONES, BUENO, AUN NO, PERO ESPERO ALGUN DIA. EL COLOR PARA BORDAR SERA EL QUE USTEDES PREFIERAN, YO, POR SUPUESTO ME FUI CON UN ROJO NAVIDEÑO. CADA SEMANA LES VOY A PONER UN NUEVO PRATRON DE MI DUENDE, HACIENDO DIFERENTES COSAS PARA LA NAVIDAD. NO DEJEN DE PASAR A RECOJER SU PATRON AQUI, Y ME DARA MUCHO GUSTO SI PUDIERAN PONER UN LINK EN SU BLOG PARA COMPARTIR CON SUS AMIGAS. MIENTRAS MAS ESTRELLAS EN EL FIRMAMENTO DE LA NAVIDAD, CUANTO MEJOR!!! 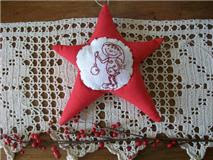 Hello, Im so happy, I just finish my little Christmas star with a little elf, the first one of 5, with a free pattern for you all. 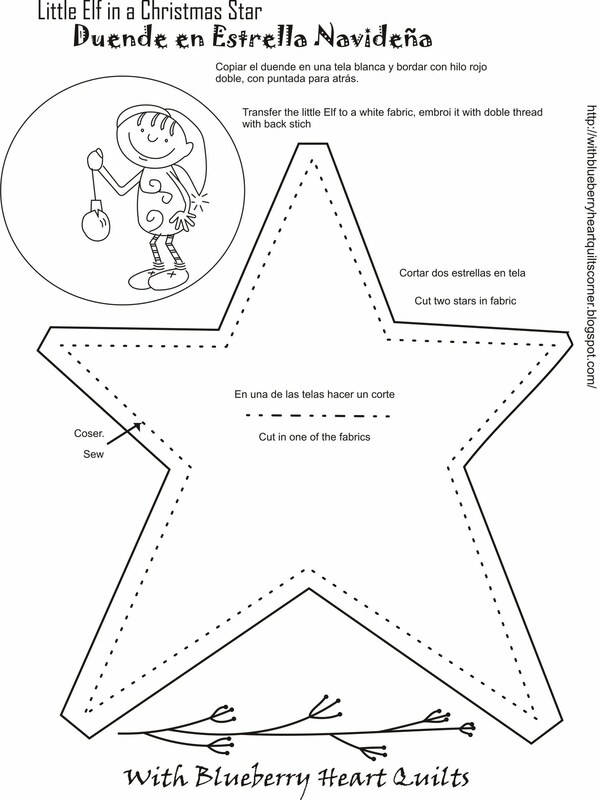 If you like my little star, put a link in your blog, to share it with more friends, quilters, and craft people, when you finish it, send me a photo of it, I will put your photo here with a link of your blog. I would love to see lots of this Christmas star in the Christmas sky, all over the world. Have a beautiful week, and have fun stiching my little elf.